Until the beginning of the 20th century, life expectancy was 50 years, and infections were usually fatal. It was only later that human beings began to live long enough for cardiovascular diseases to appear, one of the leading causes of death worldwide. 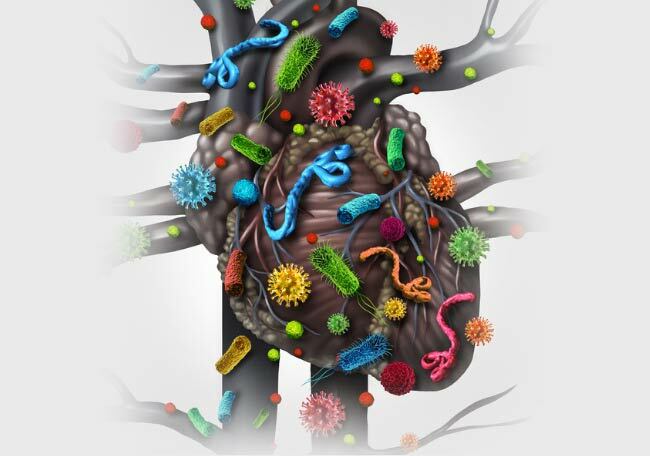 In this article we will analyze the evidence that acute bacterial and viral infections are associated with an increased risk of myocardial infarction in the short, intermediate and long term and the mechanisms that could explain this association will be examined. The increased short-term risk of myocardial infarction was mentioned associated with influenza, pneumonia, acute bronchitis and other respiratory infections. A recent study showed an increased risk of myocardial infarction during the week after laboratory-confirmed infection with the influenza virus, respiratory syncytial virus or other respiratory viruses. In a retrospective series of cases and later in a prospective study, researchers found a myocardial infarction rate of 7 - 8% among patients hospitalized for pneumococcal pneumonia. The association between pneumonia and myocardial infarction was confirmed in patients with Haemophilus influenzae pneumonia and in those with pneumonia from any cause. The risk of myocardial infarction associated with pneumonia reaches its maximum at the beginning of the infection and is proportional to the severity of the disease. A series of cases controlled by the same patients showed a marked increase in the risk of myocardial infarction during the 15 days after hospitalization due to acute bacterial pneumonia. The increased short-term risk of myocardial infarction was also mentioned associated with urinary tract infection and bacteremia. The association between acute infections and increased risk of myocardial infarction persists beyond the short post-infection period. Among patients with mild respiratory infection or urinary infection, the risk of myocardial infarction returns to the initial situation several months after the resolution of the infection. The risk of myocardial infarction after bacteremia or sepsis also decreases slowly after an acute infection. The increased risk of myocardial infarction, either short or long term, is proportional to the severity of the infection. Because the association was found with various microorganisms (viral and bacterial) and places of infection since the association is stronger and longer the more serious the infection, it is likely that the infection and host response are important determinants in this relationship. uperimposed thrombosis. Atherosclerotic plaques contain inflammatory cells. Infection in another part of the body generates circulating inflammatory cytokines, such as interleukins 1, 6, and 8 and the tumor necrosis factor α, which can activate the inflammatory cells of the atherosclerotic plaques. Animal studies and autopsy studies in humans showed that the inflammatory activity in the atheromatous plaques increases after an infectious stimulus. Inflammatory cells within the plaque increase host response proteins, including metalloproteinases and peptidases and promote an oxidative burst. All this contributes to destabilizing the plates. In order to mitigate the risk of post-infection myocardial infarction, physicians should keep in mind that the risk of it increases during and after acute infections and does not rule out the importance of increasing troponin levels.